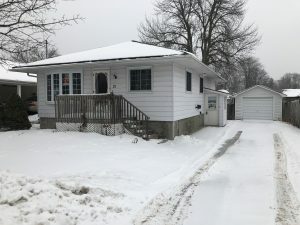 2 + 1 bungalow on East side of Trenton. This well kept home is ready and waiting for you! $1450 plus utilities (hydro, gas & water) 1-2 year lease. Home has some great features including a completely fenced backyard and brand new rear deck. Detached over-sized single car garage with ample parking in driveway for 3-4 vehicles. 2 bedroom up, master bedroom with sliding glass doors to a rear brand new deck. Large main floor bathroom with new 1 piece tub / shower. All appliances including fridge, stove, microwave, washer & dryer for Tenants use. Natural gas heat & central air. Central vac also. All applicants to be screened through Naborly, an online screening service and will be subject to a credit check. First & Last months required. Non smoking home. Available immediately. Easy to show. Lease Requirements: Credit Check, Deposit , Employment Letter, Lease Agreement, Non-Smoking Policy, References, Rental Application, Smoke-Free Building. Easy to show, vacant. Available immediately. Credit check and references needed for all applicants. Tenants screened through Naborly online screening service. SIDNEY ST NORTH, LEFT ON NORTH MURRAY ST, RIGHT ON LEONARD AVE. House on East side. Sign on.